The playLITE plastic trombone mouthpiece is ideal for all large bore brass and plastic trombones. Featuring a white plastic design, this mouthpiece is well rounded, designed for Students and Professionals alike. The plastic material makes it particularly suitable for outdoor playing if conditions are cold. 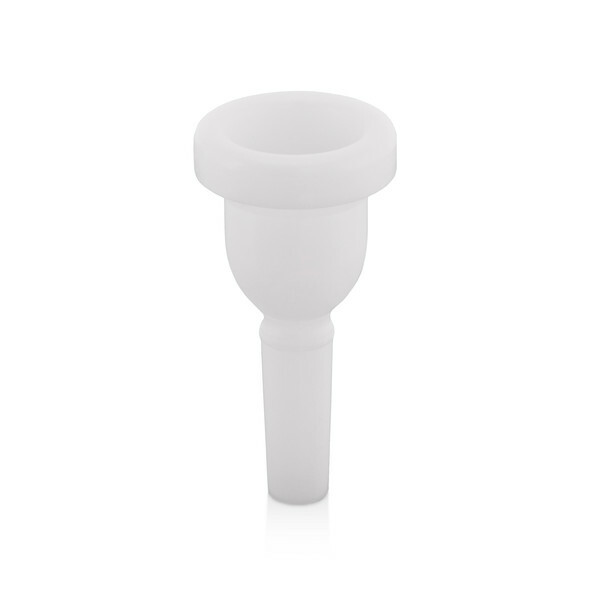 The playLITE trombone mouthpiece has a standard depth for mouthpieces and offers a cup size that is suitable for all genres of playing in all registers of the instrument. It is a great all-rounder, particularly suited to beginners and intermediate players as a first mouthpiece purchase. This mouthpiece has a medium-wide rim size, which is applicable to next to all brass players. This allows the lips to move correctly on high and low notes without it being too small thus cutting the lips, or too wide that it restricts high notes. The playLITE trombone mouthpiece is perfect for outdoor playing owing to its plastic construction. The hardy but lightweight material means that it is not affected by changes in temperatures, making it more ideal for playing in slightly more extreme temperatures. The mouthpiece can be used in all brass trombones as well as the range of playLITE Hybrid Trombones.